Know how to remove ear wax safely! In fact, when to clean ear wax because it comes off naturally. You need ear wax removal only when it creates problems! If you are habitual of cleaning your ear wax often and/or with the help of cotton swab, this is the time to change- all for the sake of your ears! Yes, wax formation in ears has a very important role to play in preventing dust and dirt particles from reaching eardrum. Ear wax traps these dust and dirt particles and therefore, you should not remove it very often. Generally, ear wax accumulates a little, dries out, and then comes out of the ear naturally carrying dirt and dust with it. However, sometimes it becomes essential to remove ear wax due to certain inconveniences. When to Remove Ear Wax? If you experience earache or a feeling of fullness in the ear as if your ear is plugged. If you experience partial hearing loss which grows with time. If you could feel noises in ear- a ringing type of tone called tinnitus. If there is itching, odor in ear or there is some kind of discharge from ear. What is Safe Method of Ear Wax Removal? 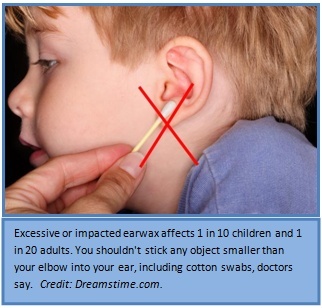 Do not ever use cotton swab or any other thing to remove wax from ear. This can lead to damage of ear drum or ear infection. These things can even further push the wax deep into ear canal making it much more difficult to remove ear wax apart from being painful. There are many ways to remove ear wax safely that can even be called home remedies for ear wax removal as you do not need medical assistance for the same. Some of such very simple methods of removing ear wax have been mentioned here. Put some oil, baby oil, glycerin or olive oil in your ears to soften the wax. After about 30 minutes or so, tilt your head to a side and let the oil flow out naturally into a clean cloth. You may also use clean water which can be squirted into the ear to remove ear wax deposits that may remain. Another method for removing wax from ear is that of irrigation or ear syringing with the help of commercially available irrigation kit. These kits usually contain solution like water and saline that has to be syringed into the ear. However, you should always warm these solutions to body temperature in order to prevent dizziness. People with diabetes, a perforated eardrum, tube in the eardrum, or a weakened immune system must exercise caution during irrigation. Its better to take assistance of a physician in such cases. You can also use specific ear drops made to soften excessive wax in ear. Follow directions given along with such ear care products. Usually, you drop the solution into the ear canal to soften and let it drain out after a few minutes naturally. 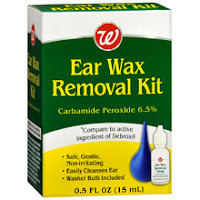 If the above home remedies for removing wax from ear do not prove to be effective, you should immediately consult doctor- an otolaryngologist who is ear, nose, and throat specialist. They use suction, special miniature instruments, and a microscope to remove ear wax in special cases.